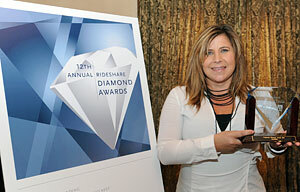 Bike-to-work programs picking up speed at Diamond Awards that showcase corporate traffic-busting commuter programs. Illuminating a stellar effort in unraveling the region’s huge traffic knot, the Corporate Blue Diamond Award for 2010 was awarded Wednesday to the California Institute of Technology, the renowned research university in Pasadena. With a robust bike-to-work and to-school program that currently attracts some 600 participants, Caltech offers a wide array of commuter services, including rideshare, transit subsidies, telework, flextime and an organized vanpool service, to a combined workforce and student population of more that 4,000. Hosted by Metro Commute Services, the Ventura County Transportation Commission and the Orange County Transportation Agency, the 12th annual Rideshare Diamond Awards showcased the alternative transportation programs of employers who provide their employees with a full range of commuter options, services and programs. In an array of categories, 26 rideshare programs coordinated by employers in Ventura, Los Angeles and Orange counties were singled out for recognition. Among them, UCLA Transportation won a Diamond Award for the short film UCLA Bike-U-mentary, released May 18 of this year just in time for Bike-to-Work Day. Presently, about 1,900 Bruins commute via bicycle to UCLA each day. Check it out on the official UCLA Transportation Blog Be A Green Commuter.com. “The Diamond Awards encourages businesses to establish, continue and improve alternative transportation options and incentives,” said David Sutton, director of Metro Commute Services. Although some form of organized ridesharing has been around since the 1970s, the recent peak in alternatives to driving alone to work may signal a turning point in relieving traffic congestion on the car-laden corridors of Southern California, he said. For a complete list of winners in Los Angeles, Ventura and Orange counties, see the news release at metro.net.